To my right is Cindy A. Jacobs, my spouse, who is also a Ph.D. economist working at the Connecticut Department of Public Utility Control as a senior research analyst. Below the family is enjoying itself in Vancouver, Canada (Summer 2000). Juliana is seated to Cindy's left and Daniel is seated to my right. In the photo above we are standing in front of the Pyramid of the Moon (approx. 500 BC) in Teotihuacan, Mexico (Spring 2004). Teotihuacan is about 30 miles northeast of Mexico City and well worth visiting. We are next to Buckingham Palace (Spring 2005), and I'm next to Stonehenge (Summer 2007)--a truly impressive site that dates back to 3500 B.C. good friend, Ravi, and I'm relaxing in my family room (Spring 2013). In front of Trinity College, Cambridge, UK (Summer 2013)--it looks almost like the one at Trinity College, Hartford, CT! Daniel and I in front of a lake in Madison, WI, where we celebrated David's graduation (my nephew) from the University of Wisconsin (Spring 2014). In the picture to the left, I'm holding a trophy for 3rd place in the Parker Holt Memorial 5K (time: 20:41; 6:39 pace per mile). Cindy and I at Montego Bay, Jamaica(November 2013) and in front of the Chicago river (Summer 2014). Above, crossing the finish line in 1st place at the Meriden 10k (6.2 miles) race to benefit mental health (May 3rd, 2014), and trying to catch up with a faster runner at Jamie's 5k run in Wethersfield, CT(Nov. 2nd, 2014). In the photos below I'm holding the 1st place overall trophy and medal (a first for me, and as you can tell I'm very happy! ),with Cindy in San Francisco (Summer 2014), receiving the first place medal for my division (50-59) at the Portland 5K road race (Fall 2013), and enjoying some down time at the International Atlantic Economic Meetings in Savannah, GA (October 2014). 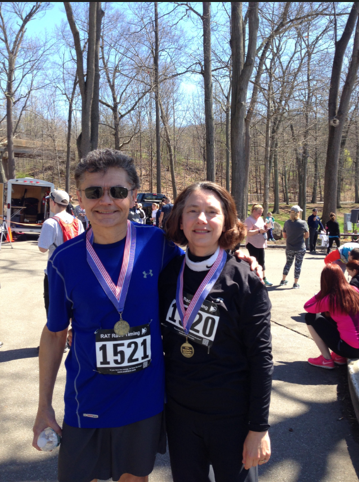 In the photo (left) above I'm crossing the finish line in 1st place (overall) at the 10k (6.2 miles) CHC road race to benefit mental health in Meriden, CT, May 2nd, 2015--this is the second year in a row that I have won this road race! In the photo (right) above I'm with Cindy, Lee, Brent, Linda and Geoff (to my far right who's 86 and ran the race!) at the Relay for Life 5K race, May 31st, 2015. 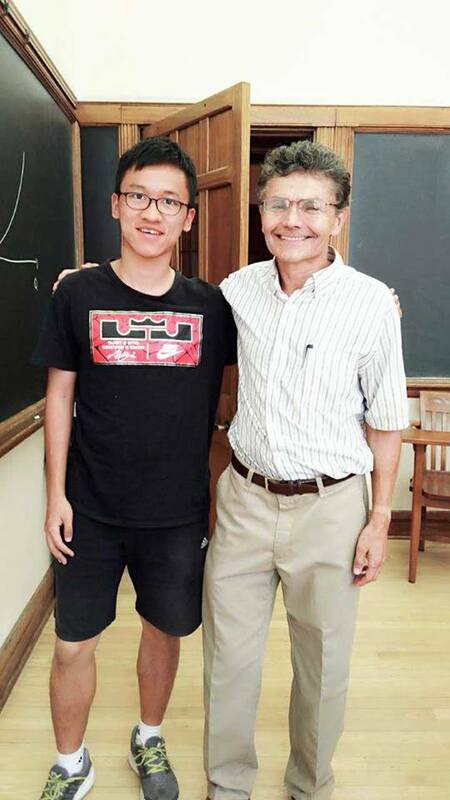 In the photo above I'm with my economics students at Yale University on the last day of Summer Session A (July 2nd, 2015). 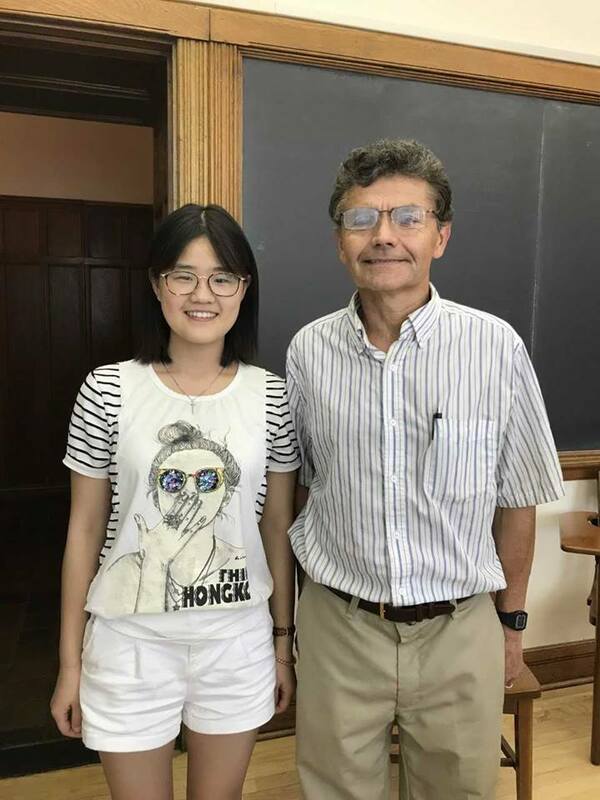 I taught a course entitled, "Topics in International Economics" (Econ. S328). In the the two photos next to it, respectively, second place winner (overall) in the St. Joseph University 5K road race (June 20th, 2015), and second place winner (overall) in the Glastonbury 5k Relay for Life road race (May 31st, 2015). In the photos above we are at West Rock Park, Westville, CT (October 2015); I'm at the Alamo, San Antonio, TX, where I attended an economics conference (November 2015), racing towards the finish line at Jamie's 5k Run, Wethersfield, CT (November 8th 2015), and at the finish line of the Manchester road race with Cindy (November 26th, 2015) . 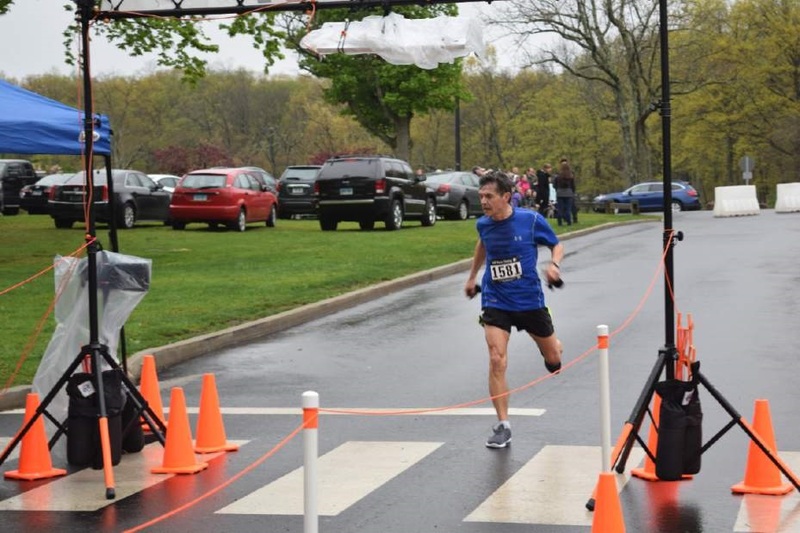 In the photo below I'm crossing the finish line in third place overall (in a time of 46 minutes) in the CHC road race to benefit mental health in Meriden, CT, May7th, 2016. In the pic below I'm with some of my Yale economics students on the last day of class (Session A, Econ. S328, July 1st, 2016). In the other pics I'm receiving the second place trophy in my division for the Scottish Rite 5K (July 23rd, 2016) and with Cindy at the Daffodil 5k (April 23rd, 2017) where we both finished first in our respective divisions! In the two pics above I'm with two of my Yale students on the last day of class (Session B, Econ. S328, August 3rd, 2017) Alyssa and Jason--their anglicized names! In the other pic I'm posing after finishing 1st in my division (and third overall!) 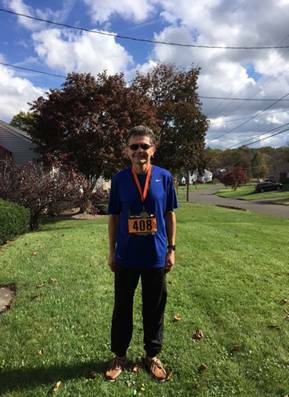 at the Storm the Castle 10k held in Meriden, CT, Oct. 28th, 2017. Office Hrs. (Fall term): On Sabbatical!! I am a native of Chile and a naturalized U.S. citizen since 1990. I received my Ph. D. in economics from the University of Illinois at Urbana-Champaign in 1984. My teaching interests are primarily in the areas of Latin American economic development and international finance. At the College I usually offer Latin American economic development (Econ. 231) during the fall term, while international finance (Econ. 316) is taught during the spring term. As far as my research is concerned, it is primarily dedicated to analyzing the challenges and opportunities that Latin American nations face as they attempt to stabilize and reform their economies. In particular, my work has reviewed and analyzed the impact of adjustment and stabilization measures in Chile and Mexico, as well as the mixed success of structural reform programs such as privatization of state-owned firms, deregulation of economic activity, and liberalization of trade and finance. For further information on my research and teaching interests, as well as useful research and teaching links, please refer to the information below. Ph.D., Spring, 1984, University of Illinois at Urbana-Champaign, Economics. Ph.D. Advisor: Werner Baer, Professor of Economics at Urbana-Champaign, Economics. Assistant Professor, Trinity College, Hartford, CT, 1985-89. Associate Professor with tenure, 1990-1996. Full Professor with tenure, 1997- present; Distinguished Ward S. Curran Professor of Economics, 2012-present..
Assistant Professor, Yale University, New Haven, CT, fall 1988; Associate Professor, Haverford College, Haverford, PA, spring 1992; Associate Professor, University of Illinois at Champaign-Urbana, Summer 1991-92; Associate Professor, Hartford College for Women, Hartford, fall 1994; Associate Professor, Yale University, New Haven, CT, spring 1995; Associate Professor, Wesleyan University, Middletown, CT, fall 1995; Associate Professor, Yale University, New Haven, CT, spring 1996; Associate Professor, Yale University, New Haven, CT, fall 1996; Professor, Yale University, New Haven, CT, summer 1997; Professor, Yale University, New Haven, CT, fall 1998; Professor, Vanderbilt University, Nashville, TN, spring 1999; Professor, Yale University, New Haven, 2005-2017. Department of Economics, University of North Florida, 1984-1985. Department of Economics, Trinity College, 1985-present. Introductory Statistics (Econ. 107); Introductory Economics (Econ. 101); International Finance (Econ. 316); Macroeconomic Theory (Econ. 302); Graduate Macroeconomics (Econ. 502); Latin American Economic Development (Econ. 231); Econometrics (Econ. 318); History of Economic Thought (Econ. 331-04); Graduate International Finance (Econ. 817); Economies of the Third World (Econ. 317); Structural Reform in Latin America and the Caribbean (Econ. 313); Issues in International Trade and Development (Econ. 331); Issues in International Finance (Econ.331); Global Financial Instability (Econ. 331); Applied Econometrics: Time-Series Analysis (Econ. 328); Issues in International Trade and Finance (Econ. 331). Theories of International Trade (Econ. 315). Ramirez, Miguel D., "FDI Flows to Latin America: A Pooled and Cointegration Analysis, 1980-2014," Business and Economic Research, Vol. 7, No. 2 (2017): 178-201. "Economic and Institutional Determinants of FDI in the Chilean Case: An Empirical Analysis, 1960-2014," Research in Applied Economics, Vol. 9, No. 3 (September 2017): 1-23. Ian Schaeffer and Miguel D. Ramirez, "Is there a Long-Term Relationship among European Sovereign Bond Yields? "​ Business and Economic Research, Vol. 7, No. 1, 2017, pp. 68-86. Hyungsun Chloe Cho, and Miguel D. Ramirez, "Foreign Direct Investment and Inequality in Southeast Asia: A Panel Unit Root and Panel Cointegration Analysis, 1990-2013," Atlantic Economic Journal, Vol. 44, Issue 4 (December 2016): 411-424 (Lead Article). Steven Yee and Miguel D. Ramirez, "Purchasing Power Parity: A Time Series Analysis of the U.S. and Mexico, 1995-2007. "​ International Advances in Economic Research, Vol.22, Issue 4 (November 2016): 409-419. Jiayi Huang and Miguel D. Ramirez, "Do Exports Lead Economic Output in Five Asian Countries? A Cointegration and Granger Causality Analysis," Business and Economic Research, Vol. 6, No. 2 (2016): 30-50. Juan Diego Lopez, and Miguel D. Ramirez, "Are Controls Effective in Curbing Private Capital Flows in Colombia? A Time-Series Analysis," Journal of Empirical Economics, Vol. 5, No. 1 (2016), pp. 23-34. Hyungsun Chloe Cho, and Miguel D. Ramirez, "Money Demand in Korea: A Cointegration Analysis, 1973-2014," Business and Economic Research, Vol. 6, No. 1 (2016): 96-110. Kyle A. Johnston and Miguel D. Ramirez, "Foreign Direct Investment and Economic Growth in Cote D'Ivoire: A Time Series Analysis," Business and Economic Research, Vol. 5, No. 2 (2015): 35-47. Miguel D. Ramirez and Zsofia Komuves, "Economic Infrastructure, Private Capital Formation, and FDI Inflows to Hungary: A Unit Root and Cointegration Analysis with Structural Breaks," Atlantic Economic Journal, Vol. 42, Issue 4 (December 2014): 367-382. "Credit, The Turnover of Capital, and the Law of the Falling Rate of Profit: A Critical Note." Contributions to Political Economy, Vol.33, No. 1 (June 2014): 61-68. "Remittances and Economic Growth: An Empirical Study with Structural Breaks, 1970-2010," Business and Economic Research, Vol. 4, No. 1 (June 2014): 353-372. Zsofia Komuves and Miguel D. Ramirez, "FDI, Exchange Rate, and Economic Growth in Hungary, 1995-2012: Causality and Cointegration Analysis," Applied Econometrics and International Development, Vol. 14, Issue 1, (2014): 45-58. "Is Capitalist Globalization Inevitable in the Marxian Paradigm," Journal of the History of Economic Thought, Vol. 36, Issue No.1 (March 2014): 83-95. "Do Financial and Institutional Variables Enhance the Impact of Remittances on Economic Growth in Latin America and the Caribbean? A Panel Cointegration Analysis." International Advances in Economic Research 19, no. 3 (August 2013): 273-288. Blake Tretter and Miguel D. Ramirez, "The Effect of Myanmar's Foreign Investment Policies on FDI Inflows: An Analysis of Panel Data Across ASEAN Member Countries," International Journal of Accounting and Economic Studies, Vol.1, No. 3 (2013): 84-99. "What Explains FDI flows to Latin America? A Pooled Analysis, 1980-2006," International Journal of Accounting and International Studies," Vol. 1, No, 2, 2013, pp. 25-38. Racha Menhem and Miguel D. Ramirez, "The Greek Sovereign Debt Crisis: A Conceptual and Empirical Analysis," International Journal of Economic Issues, Vol. 5, No. 2, 2012, pp. 127-142. Aalok R. Pandey and Miguel D. Ramirez, "Why Does the Cost of Credit Increase for Small Firms Relative to Large Firms during Recessions? A Conceptual and Empirical Analysis," International Journal of Business and Economic Research, Vol. 10, No. 2, 2012, pp. 291-313. "Are Foreign and Public Investment Spending Productive in the Argentine Case? A Single Break Unit Root and Cointegration Analysis, 1960-2010," Modern Economy, Vol. 3, No. 6, October 2012, pp. 726-737. "Is the Falling Rate of Profit the Driving Force Behind Globalization?" Contributions to Political Economy, Vol. 31, No.1, April 2012, pp. 1-12. "Foreign Direct Investment and its Determinants in the Chilean Case: Single Break Unit Root and Cointegration Analysis," Applied Econometrics and International Development, Vol. 11, Issue 1, 2011, pp.1-32. "Is Foreign Direct Investment Productive in the Latin American Case? A Panel Cointegration Analysis, 1980-2002," The International Trade Journal, Vol. 25, Issue No. 1, 2011, pp. 35-73. "Are Foreign and Public Capital Productive in the Mexican Case? A Panel Unit Root and Panel Cointegration Analysis," Eastern Economic Journal, Vol. 36, No.1, Winter 2010, pp. 70-87. "Remittances and Growth in Latin America," Estudios Economicos de Desarrollo Internacional, Vol. 9, Issue 1, 2009, pp. 1-33. "Marx's Theory of Ground Rent: A Critical Assessment," Contributions to Political Economy, Vol. 28, No. 1, June 2009, pp. 71-91. "Foreign Direct Investment and Its Determinants in the Chilean Case: An Error Correction Model Analysis, 1960-2002," Yale Department of Economics Working Papers, Discussion Paper No. 62, Yale University, Department of Economics, New Haven, June 2009, pp. 1-33. "Public Capital Formation and Labor Productivity Growth in Argentina, 1960-2005," Applied Econometrics and International Development, Vol. 9, No.1, Spring 2009, pp. 1-29. Hari Sharma and Miguel D. Ramirez, "Remittances and Growth in Latin America: A Panel Unit Root and Panel Cointegration Analysis," Yale Department of Economics Working Papers, Discussion Paper No. 51, Yale University, Department of Economics, New Haven, June 2008, pp. 1-38. "Are Foreign and Public Capital Productive in the Mexican Case? A Panel Unit Root and Panel Cointegration Analysis, Yale Department of Economics Working Papers, Discussion Paper No. 49, Yale Department of Economics, New Haven, May 2008, pp. 1-33. "What Explains Latin America's Poor Investment Performance During the 1980-2001 Period? : A Panel Unit Root Analysis," International Review of Applied Economics, Vol. 22, No.1, January 2008, pp. 1-15. "A Panel Unit Root and Panel Cointegration Test of the Complementarity Hypothesis in the Mexican Case, 1960-2001," Atlantic Economic Journal, Vol. 35, No. 3, September 2007, pp. 343-356. "Marx, Wages, and Cyclical Crises: A Critical Interpretation," Contributions to Political Economy, Vol. 26, No. 1, August 2007, pp. 27-41. "Is Foreign Direct Investment Productive in the Latin American Case? A Panel Unit Root and Panel Cointegration Analysis," Yale Department of Economics Working Papers, Discussion Paper No. 23, Yale University, Department of Economics, New Haven, May 2007, pp. 1-45. "Does Foreign Direct Investment Enhance Private Capital Formation in Latin America?� The Journal of Developing Areas, Vol.40, No.1, Fall 2006, pp.81-97. "Latin American Investment Performance During the 1980-2002 Period: A Panel Cointegration Approach," Applied Econometrics and International Development, Vol. 6, No. 2, May-August 2006, pp. 109-124. "Does Foreign Direct Investment Enhance Labor Productivity Growth in Chile? A Cointegration Analysis," Eastern Economic Journal, Vol. 32, No. 2, Spring 2006, pp. 205-220. "A Panel Unit Root and Panel Cointegration Test of the Complementarity Hypothesis in the Mexican Case, 1960-2001," Center Discussion Paper No. 942, Economic Growth Center, Yale University, New Haven, August 2006, pp. 1-29. "Economic and Institutional Determinants of Foreign Direct Investment in Chile: A Time-Series Analysis, 1960-2001," Contemporary Economic Policy, Vol. 24, No. 3, July 2006, pp. 459-471. "Is Foreign Direct Investment Beneficial for Mexico? An Empirical Analysis, 1960-2001," World Development, Vol. 34, No. 5, May 2006, pp. 802-817. "Did Institutional Factors Enhance FDI Flows to Chile during the 1985-2001 Period? An Error Correction Analysis," Journal of Emerging Markets, Vol. 10, No. 1, Spring 2005, pp.18-29. "Foreign Capital and Labor Productivity Growth in Chile," Problemas del Desarrollo, Vol. 36, No. 140, January-March (2005), pp. 44-61. "Is Public Infrastructure Spending Productive in the Mexican Case? A Vector Error Correction Analysis," The Journal of International Trade and Economic Development, Vol. 13, No.2, June 2004, pp. 159-178. "Is Foreign Direct Investment Beneficial to Mexico?" International Advances in Economic Research, Vol. 10, No. 1, February 2004, pp. 83-85. "Mexico Under NAFTA: A Critical Assessment," The Quarterly Review of Economics and Finance, Vol. 43, No. 5, Winter 2003-04, pp. 863-892. Miguel D. Ramirez and Nader Nazmi, "Public Investment and Economic Growth in Latin America: An Empirical Test," Review of Development Economics, Vol. 7, No. 1, February 2003, pp.115-126. Miguel D. Ramirez, "Public Capital Formation and Labor Productivity Growth in Mexico," Atlantic Economic Journal, Vol. 30, No. 4, December 2002, pp. 366-379. "Foreign Direct Investment in Mexico during the 1990s: An Empirical Assessment," Eastern Economic Journal, Vol. 28, No.3, Summer 2002, pp. 409-423. "The Mexican Regulatory Experience in the Airline, Banking and Telecommunications Sectors," The Quarterly Review of Economics and Finance, Vol. 41, No. 5, 2001, pp. 657-681. "Foreign Direct Investment in Chile and Mexico during the 1990s: A Critical Assessment," Latin American Business Review, Vol. 2, No. 1, 2001, pp. 55-82. "The Impact of Public Investment on Private Investment Spending in Latin America, 1980-1995: A Pooled Regression Analysis," Atlantic Economic Journal, Vol. 28, No.2, June 2000, pp. 210-225. "Public Capital Formation and Labor Productivity Growth in Chile," Contemporary Economic Policy, Vol. 18, No.2, April 2000, pp. 159-169. "Foreign Direct Investment in Mexico: A Cointegration Analysis," The Journal of Development Studies, Vol. 37, No.1 (October 2000), pp. 138-162. Shahryar Khan and Miguel D. Ramirez, " A Cointegration Analysis of PPP, 1973-1996," International Advances in Economic Research, Vol. 5, No. 3, August 1999, pp. 369-385. "Does Public Investment Enhance Labor Productivity Growth in Chile? A Cointegration Analysis," The North American Journal of Economics and Finance, Vol. 9, No. 1, Fall 1998, pp. 45-65. "Privatization and Regulatory Reform in Mexico and Chile: A Critical Overview," in Quarterly Review Of Economics and Finance, Vol. 38, No. 3, Fall 1998, pp. 421-439. "Does Public Investment Enhance Productivity Growth in Mexico? A Cointegration Analysis," Eastern Economic Journal, Vol. 24, No.1, Winter 1998, pp. 63-82. Development Banking in Mexico. New York: Praeger Publishers, 1986. Mexico's Economic Crisis: Its Origins and Consequences. New York: Praeger Publishers/Greenwood Press, Inc., 1989). "Economic and Social Consequences of the National Austerity Program in Mexico," in Howard Handelman and Werner Baer (eds.) Paying the Costs of Austerity in Latin America. Boulder, CO: Westview Press, 1989). "Privatization and the Role of the State in Post-ISI Mexico," in Werner Baer and Melissa Birch (eds.) Privatization in Latin America. New York: Praeger Publishers, 1994. "El Programa mas reciente de estabilizacion auspiciado por el fmi," in Alicia Giron y Genoveva Roldan, eds. Mexico: Presente, Pasado y Futuro. Mexico, D.F. : Editorial Siglo XXI, 1996, pp. 79-104. "The Mexican Economy," in Laura Randall, ed. Latin American Economies in the Post War Period. Austin: The University of Texas Press, 1997, pp. 111-148. "The Evolution, Rationale, and Impact of Mexicos Privatization Program," in Jerry Haar and Melissa Birch, eds. Latin American Privatization. Miami, FL: The North-South Center, 2000, pp. 51-76. "FDI in Mexico and Chile: A Critical Appraisal," in Werner Baer and William Miles, eds. Foreign Direct Investment in Latin America. New York: The Hayworth Press, 2001. "Foreign Direct Investment in Chile: An Empirical Analysis," in Frank H. Columbus, ed. Politics and Economics of Latin America. New York: Nova Science Publishers, Inc., 2001, pp. 109-134. "Privatization in Mexico and Chile: A Critical Perspective," in David Parker and David Saal, eds. International Handbook on Privatization. Northhampton, Mass. : Edward Elgar Publishing Limited, 2003, pp. 262-291. "An Empirical (Pooled) Analysis of Latin America's Poor Investment Performance During the 1980-1999 Period," in Albert Tavidze, ed. Progress in Economic Research, Volume 10. New York: Nova Science Publishers, Inc., 2006, pp. 115-136. "Determinantes economicos e institucionales de las corrientes de inversion extranjera directa a Chile, 1985-2001. Un analisis de cointegracion," in Alicia Giron y Eugenia Correa, eds. Asimetrias e Incertidumbre. Los Desafios de una Estrategia Economica Alternativa para America Latina. Mexico, D.F. : Plaza y Valdes Editores, 2009, pp. 215-231. "Are Foreign and Public Investment Productive in the Argentine Case? A Single Break Unit Root and Cointegration Analysis, 1960-2010," in Maria Esther Morales y Leobardo De Jesus Almonte, eds. Inversion Extranjera Directa en America Latina. Mexico, D.F. : Bonillas Artigas Editores S.A. de C.V., 2015, pp. 65-93. "The IMF and Global Financial Crises: Phoenix Rising?" Eastern Economic Journal, Vol. 42, No.4, Fall 2016: 676-678. "The Economics of Financial Turbulence: Alternative Theories of Money and Finance," Capital and Class, Vol. 37, No.3, October 2013, pp. 502-506. "Latin American Neostructuralism: The Contradictions of Post-Neoliberal Development," Review of Radical Political Economics, Vol. 43, No. 4, Fall 2011, pp. 587-591. "The Confiscation of American Prosperity," Review of Radical Political Economics, Vol. 42, No. 3, Summer 2010, pp. 404-407. "Falling Behind: Explaining the Development Gap Between Latin America and the United States," Eastern Economic Journal, Vol. 36, No. 3, Summer 2010, pp. 417-421. "Living Standards and the Wealth of Nations: Successes and Failures in Real Convergence," Journal of Regional Science, Vol. 48, No. 3, August 2008, pp. 677-681. "Boom-Bust Cycles and Financial Liberalization," Eastern Economic Journal, Vol. 33, No.4, Fall 2007, pp. 569-571. "The New American Regionalism," Journal of Regional Science, Vol. 45, No. 3, August 2005, pp. 646-649. "Democratization Without Representation: The Politics of Small Industry in Mexico," Latin American Politics and Society, Vol. 47, No.3, Fall 2005, pp. 173-178. "The Transformation of Latin America," Eastern Economic Journal, Vol. 28, No.2 Spring, 2002, pp. 279-282. "Mexican Banking and Investment in Transition," Journal of Interamerican Studies and World Affairs, Vol. 40, No. 2, Summer 1998, pp. 300-305. "Economic Policy and Stabilization in Latin America," Southern Economic Journal, Vol. 64, No.1, July 1997, pp. 360-62. "Desert Capitalism," Journal of Developing Areas, Vol. 32, No. 1, fall 1997, pp. 278-282. "Mexico: The Remaking of an Economy," Southern Economic Journal, October 1994, 61, no.2, 556-558. "North American Free Trade: Assessing the Impact," in the North American Journal of Economics and Finance, Fall 1993, 4, no. 2, 271-73. "The Latin American Development Debate," in the Southern Economic Journal, July 1993, 60, no.1, 265-68.